Months aren’t necessarily the way farmers and growers measure their years. They tend to focus more on seasons – specifically, planting season and harvest season. These are two times of the year that extra hands may be needed at many agricultural operations, and so seasonal workers are sought out and hired. Once an employee is hired, though, what comes next? Most employers are familiar with the concept of orientation – filling out the necessary paperwork, introducing the new person to their coworkers and providing information about job duties, working hours, performance standards, benefits and facilities. Once these onerous tasks are completed, the new person is usually expected to jump right in. That “sink or swim” mentality could lead to problems as minor as miscommunications or as major as serious injuries. That’s why some familiar with the field are advocating for onboarding instead of orientation. 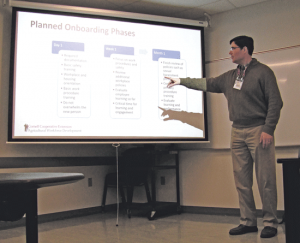 Cornell Cooperative Extension Ag Workforce Specialist Richard Stup said the goal of onboarding is to focus specifically on job training, compliance and safety training. “On an employee’s first day, do they get the attention they need or do they just get pushed out into the field?” Stup asked a group of farmers at a recent workshop covering this topic. Those in attendance replied that the latter is usually the case. “Farms can be dangerous places, and even after a month the new employees may not have received all the training they need,” Stup noted. That’s why a formal process is needed as part of the onboarding process. Two studies (one completed in 2013, the other in 2017) showed onboarding could improve the psychology and view of jobs. He added that ideally, an employee’s direct supervisor would be the one leading their onboarding. One person should be responsible for the process so that it is carried out consistently. With standard operating procedures and training skills, planning is important, as is evaluation. “The goal is to make sure people learn the stuff that is important,” Stup reiterated. Additionally, compliance and documentation will be much more important going forward because consumers are interested in the ethical treatment of both workers and animals, Stup explained. Focusing on the individual and engagement is more important than ever, and that is partially due to America’s economic climate. As of January 2019, the U.S. had 4 percent unemployment. There are now more jobs than people to fill them. The challenge, Stup said, is how to build the best of every employment relationship. “We need immigration to fill some of these jobs,” Stup stated. A solid onboarding system is needed for migrant workers as well, as studies have shown fewer young Mexicans are traveling to the U.S. to look for work for a number of reasons (including a large drop in the country’s fertility rate as well as better education, more job opportunities and an overall better economy in Mexico than in the past). “Thinking about ten to twenty years down the road, we’re likely to bring in more workers from Asia and Africa because of the population growth happening there,” Stup said. That will make stressing compliance, clarification, culture and connection even more important.